Cleaning the bathroom is an essential part of the household chore. You should clean your bathroom from time to time if you don’t want the shine of the tile to fade away. But it’s not just to make your bathroom neat and fresh; there’s more to it. The bathroom is a humid area for the water preserved in the cistern. Wet areas are known to be perfect for germs to breed in them. Germs and bacteria absorb organic waste and release gases which results in a bad smell. You don’t have to deep clean your bathroom regularly. You can do the work each week, so you’ll find it easier to keep it clean. 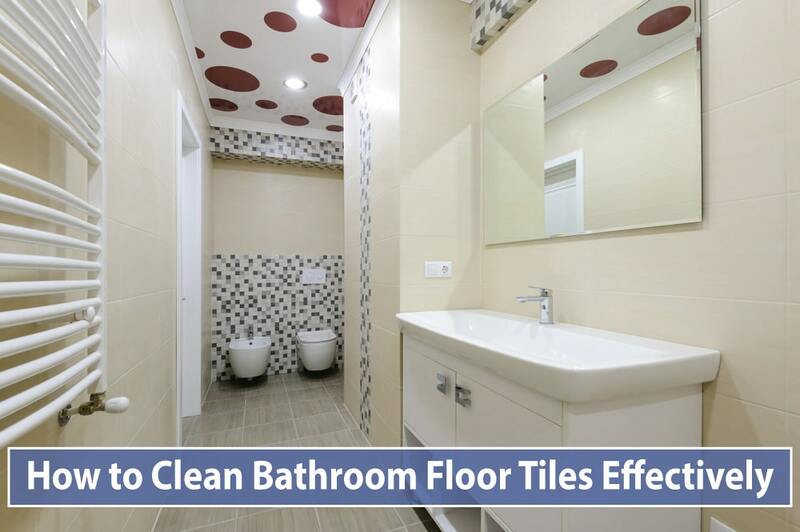 Cleaning bathroom regularly will not only make it look fresh and also will make it hygiene. If you are wondering on how to clean bathroom floor tiles, then let me shine some light on the matter. After I finish, you’ll see it is quite effortless to keep the shower clean. Cleaning the whole house but not giving enough attention to the bathroom and hoping to achieve a hygiene atmosphere at home is futile thinking. Carefully read the cleaning methods explained below and determine the suitable one for you. Vinegar is a natural cleaning agent; also the most reliable and popular method. Being mildly toxic acid, it can dissolve limescale and grimes easily. You won’t even lose a drop of sweat it’s that effortless. First, sweep the floor clean using a broom or dust brush. It will remove all the scattered pieces of rubbish, or wet dirt remains from the floor. Or use a vacuum cleaner to remove all loose dirt from the surface of the floor. Mix equal amount of hot water and vinegar in a bucket. Take a large enough bucket so that you can easily rinse the mop. Dip the mop in the bucket of hot water and vinegar. Lift the mop and wring it out. Mop the floor using slide-to-slide motion. Rinse the mop and wring it frequently while you’re mopping. When you’re finished with mopping the floor with vinegar, it’s time to rinse the floor with clean water. Fill a bucket with fresh hot water. Dip the mop in the bucket of water and mop the floor using side to side motion. Use vinegar and baking soda to form a paste and apply the paste in order to clean the stains. Use a wet paper towel or sponge while removing the paste. First, take a water spray bottle, since it will be more convenient, and then pour equal parts of vinegar and water. Make the solution as much as you desire according to your need. After you have finished adding all the ingredients, screw the nozzle and shake the solution properly to mix the ingredients well. Spray the surface of the tile thoroughly with the vinegar solution. Once you are done spraying, allow the solution to sit on the tile. Wait for a few minutes such as 1-5 minutes. The time is more likely to depend on the density of grime you are about to remove. After the cleaning solution of vinegar is ready to clean on the tile surface, rinse it off with fresh hot water. You can just pour water on the tile surface to wash the vinegar solution off. Or you can use a warm wet towel and wipe the tile surface. In order to clean grout from the bathroom floor, pour vinegar along with the tile edges. To make it more effective, apply at full strength. You can also use it diluted with water. After covering the vinegar on the tile edges, allow it to soak. Wait for 10 minutes to let the vinegar sit allowing the vinegar to soak into the grout. This way it will help loosen the dirt and stains on the grout. Now scrub the grout with a brush. It could be an old toothbrush, or you can use a small cleaning brush. Scrub it using small, circular motions. Make sure to scrub it properly to get the debris and stains off from the grout. After you’re finished with scrubbing the grout, rinse away the vinegar mixture with clean and hot water. Pour clean water over the tile. Or you can take a clean wet cloth and wipe it. Make a baking soda paste mixing baking soda and water. Take a bowl and combine an equal amounts of baking soda and water. Now stir the ingredients well until it’s turned into a paste. This way it can be easily applied to the grout. Take a small brush. Pick up the baking soda paste and apply it to the grout with the help of the brush. You can use the same brush you’re going to use to scrub the grout later. The grout brushes can be easily found at home or in local stores. Or you can also use a sponge or an old toothbrush if you don’t have a scrub brush. Now make vinegar and warm water solution in a spray bottle. Make sure to use warm water when making the solution. Combine equal amount of water and vinegar in the spray bottle. Spray bottles make it easier to apply. Spray the mixture directly to the grout. Let the baking soda sit for five minutes. You’ll notice a fizz caused by the mixing of vinegar. The fizz loosens the grime on the grout. Scrub the grout with a stiff-bristled brush, sponge or toothbrush. This will remove most of the grime remains. After you’re done with scrubbing, wipe the dirty vinegar and baking soda. Use paper towels or old rags to clean up the mess properly. Set 1 tablespoon of baking soda and a cup of warm water in a spray bottle and mix them well. Now add one-fourth cup of vinegar to the baking soda solution carefully. You can also add essential oils that will help you clean and also add a sweet scent to the solution. Shake the bottle well before using. In order to clean the floor, take a mop and add microfiber cloth to it by wrapping it around the bottom. Now spray the Baking soda solution onto the microfiber. Clean the surface of the tile properly using the mop. Use back and forth motion to clean the floor. It doesn’t have to be rinsed. Shake the bottle properly before every use. Let the wet tiles air dry. Muriatic acid, also known as hydrochloric acid is one of the best and most corrosive cleaners. It is strongly effective at removing rust, uric acid, moss and also bore water stains. It should be used properly to avoid possible damages. First of all, ventilate the room. Using acid inside the home can cause accidents if you’re not careful, so make way for the harsh fumes to leave. You can use a fan too. Use a big bucket, fill the bucket with water, a gallon should enough or you can add or lessen the amount depending on the size of your bathroom. Add a cup of acid for a gallon of water. Mix slowly to avoid any sudden chemical reaction, and of course, putting on a face mask and hand gloves is a must. Did I mention to use plastic(ish) container? Using metallic bucket can be absolutely hazardous, so refrain yourself from using that. After you have safely made the acid solution, apply it over the stained tiles with a paint brush. Cover the tiles with the mixture carefully. Waiting a few minutes shall be enough to make the scum of tile surface come loose. If any acid spills on a place you don’t want immediately sprinkle baking soda over it, it will create a chemical reaction that will result in neutralizing the acid. Pour clean water on the tiles to wash off the acid completely. Take a stiff bristled brush and scrub over the stains. After cleaning the dirt, wash the tiles with water again. Repeat these steps over and over again until you think the all the acid has been washed away and the tiles clean enough to you. Leave the bathroom door and ventilator open for some time; it will take care of the smell by itself. You should rely on acid to clean tile when all other methods have failed you. It requires much attention and involves way too much risk. Comparing to the store bought cleaning materials using materials from your kitchen is easier, safe and also cheap. ​ Regular cleaning can ensure the longevity of the tiles. We all know how costly repairing or retiling can be, why bother when you can easily save those expenses by cleaning the bathroom maintaining a cleaning schedule, it may seem like an insignificant move, but actually it bears more meaning to it. You’ll see that most methods come fairly cheap, so what are you waiting for? Make the tiles of your bathroom shine like new ones with an effort that will feel really low comparing to the outcome.